It was a normal New York day in May 1942. I.Russell Sorgi, a photographer for the Buffalo Courier-Express was returning to the office following an assignment but for reasons unbeknown to us, he chose an alternative route. 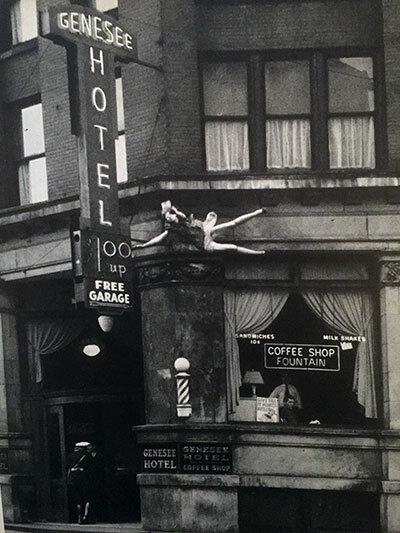 As he drove he was passed by a speeding police car, sensing a story in the making Sorgi, followed in pursuit to the Genesee Hotel where a thirty-five year old woman was sitting on an eighth floor window ledge whilst police and onlookers tried desperately to talk her into going inside. Mary Margaret Miller had earlier checked into the hotel, signing the register as ‘M.Miller’. She lived with her sister in Buffalo and made for the hotel under the pretence she was visiting relatives in Indiana. Finding a suitable bathroom close to her room she locked the door behind her and made her way to the window ledge. Once in position, she remained there for some twenty minutes, swinging her legs and calling down to passers by. The picture is dramatic enough but given the period and the plate camera Sorgi used it makes the image all the more remarkable. As with many other photographs of this type questions were asked of the photographer and his sense of priority. If one had to defend Mr Sorgi then the presence of the police would, I suggest suffice. Where the blood runs a little cold is his undoubted sense of professionalism in taking a couple of test shots first. Here we see his photojournalist instincts come to the fore, he knew the shot he wanted to get, however noxious, and coolly and calmly set about getting it. The ‘extras’ in the shot help make the image complete, Sorgi cannot and did not take credit for their parts in the single frame story, we see a policewoman dashing through the door into the building and a man seemingly indifferent to the scene outside being waited on by the hotel staff. It unwittingly captures a moment in time quite like no other. There are so many elements within the photograph to absorb, the hidden depression of the woman and how she must have bravely carried it, how a life can be so quickly extinguished as others, such as the man in the window, carries on. Mary Miller’s suicide gave Sorgi’s life a degree of fame he would not likely have gained otherwise and as a result, her death became more about the freeze framing of her fall and the technicalities behind it rather than her own personal, tragic story. How quickly we forget the person in the headlong rush for the sensational.